I am going to show you a sneak peek into the "work" that my co-worker and I have been doing at work. It had been a LONG day at work so Floppity wanted to go home... he was going to ride into the sunset. 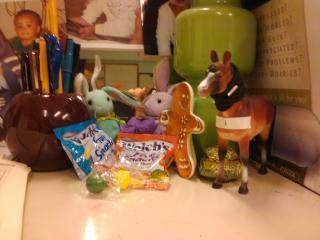 My co-worker send me this picture when I went to lunch, the bunnies, Ginnie the horse, and the gingerbread cookie man decided to have a party while I was away See the fruit snacks and the jaw breakers? If you want to continue "The Secret Life of Bunnies" follow me on my TUMBLR who knows what type of trouble they will find themselves in next?